In the summer of 2017, IQRF Tech was founded, the MICRORISC?s spin-off, to take over all activities related to research, development, and sales of IQRF technology. This company is the gateway provider in the IQRF ecosystem. 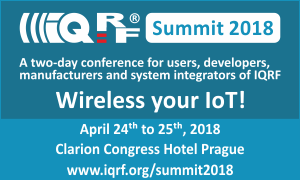 From any gateway, you can easily create an IQRF Gateway by adding a USB IQRF transceiver and running an IQRF Daemon. This software was created for the IoT Starter Kit ? pilot product (www.iqrf.shop) which, among other things, can be used to test your solution. The installation is simplified and well documented. You can also connect other external hardware such as sensors or active components to this kit. One of the providers of quality sensors of internal air pollution is Protronix company. One of the first who successfully completed the certification process of interoperability of its IQRF devices, which is ensured by complying with standardized control commands. Sensors of CO2, temperature, relative humidity or other environmental pollutants in buildings can be found at http://www.iqrf.shop where you can purchase samples. This company develops intelligent systems and services to inform users about the current state of the environment or the crisis situation based on acquired sensor data. Their phone and notification services are used today by rescuers or dispatchings who receive warnings in dangerous situations as well as owners of large plots of land (forests including) when unauthorized manipulation of property occurs. Alarms are reported to users via an automated phone call or via SMS. Phone services also include the complete operation of the call center. CTI Software also has control and monitoring software for public and industrial lighting.